I didn't make these but aren't they fun? I found them at the AKS Gem Show last Friday. I picked up a pair for me and one to give away on my blog. All you have to do is leave a comment with a way to contact you. I will use the lucky number generator to pick a winner on Wednesday April 28th. It also a symbol for the New Orleans Saints. After Hurricane Katrina it was used a symbol of rebirth in New Orleans. They are geate.. :) i like colours! Not only fun, these are happy earings! Those are really cute! What are they made of? Love the earrings, also love your work. So glad I discovered this blog! I love the colors in these earrings. Please enter me! Those are great colors - what's the material? Is it metal? Plastic? Love them! I live in Louisiana so anything Fleur De Lis is awesome! These earrings are made out of a lead-free metal. The design is painted on to the fleur de lis. It looks like an enamel finish. I love your work. I am a beginner at beading. These are so cute - and so mardi gras! they'll go great with anything! These are so cute and colorful! 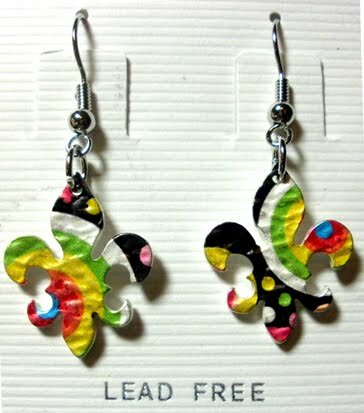 perfect for mardi gras - all year long! I love 'em, and since I went to NO before you did, I oughta get them! They really are beautiful! What's On Your Beading Table?